Join us for a Pioneer Girl themed Fall Camporee as we pack up our camping gear and head to Camp Anderson in Tyrone. New adventures and fun await you at this new location and we hope you will join us as we travel this trail. 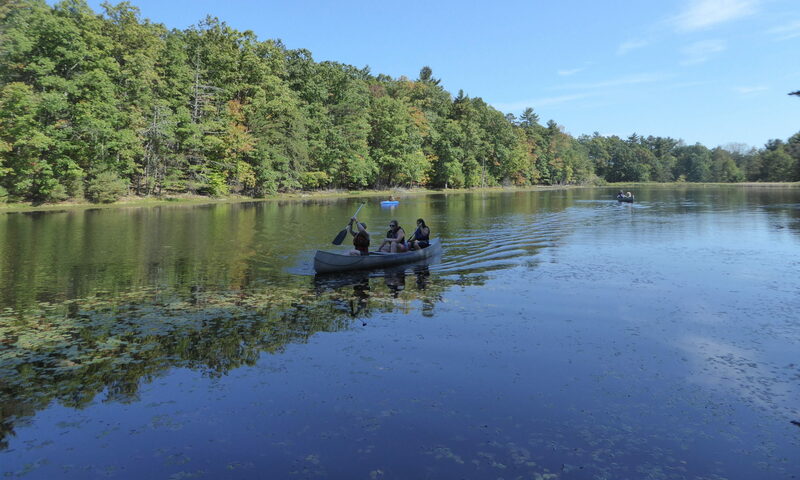 Activities may include Fishing, Archery, BB Guns, Rifle Shooting, Hiking, Pioneer cooking, Crafts, Games, Firebuilding, Knot-tying and Lashing, Orienteering (map and compass skills). Troops can choose to stay overnight or just spend the day at camp. Camp Anderson has 32 indoor spots in two different cabins. First priority for these spots will be given to people with specific needs (need outlets for medical devices, documented severe anxiety, etc). There are 40 spots in 4-person canvas tents for troops who do not have access to their own tents or who prefer to sleep in a more traditional established campsite. Additional overnight camping spots will be in tents (which you must provide). Tenting units are spaced out all over camp and you can request a spot closer to central camp and nearest bathrooms, or you can request more private camping spots to enhance your pioneer experience. Please describe your accommodation preferences in the booking comment when making your reservation. Troops staying overnight on Friday should plan their own Saturday morning breakfast. Do not plan on having access to a kitchen. Registration will open August 1, 2018 and run through September 2, 2018. This is a troop travel experience and as such each troop will need to submit a travel roster to council 2 weeks prior to the trip. Troops are expected to meet their troop travel ratios and have a certified first aider. If your troop does not meet travel ratios or does not have a first aide certified volunteer, you will need a partner troop. If you need help finding a partner troop, please contact the camp committee. All adults are expected to be GSHPA registered and cleared volunteers. Juniors and up are eligible to register as Camp Helpers. Camp Helpers will help younger troops with their camp activities – teach skills and lead games. Camp Helpers will earn service hours and make progress towards the various mentoring awards (Junior Aide, Cadette Program Aide, Service to Girl Scouts, etc). Camp Helpers should plan to spend the full weekend at camp – arrive Friday night and depart Sunday morning. Camp Helpers will have a mandatory orientation meeting on Friday evening. Please note on your registration comment what kinds of outdoor skills your Camp Helpers are comfortable teaching. Early bird pricing will run until Aug 19th. In order to qualify for Early Bird pricing, your roster must be approved and paid in full no later than Aug 25th. Payment is due when your roster is accepted. Financial Assistance: Financial assistance may be available through council. Make sure to indicate that you are applying for a “Troop Outdoor Experience” and NOT a “Day Camp/Camporee”. To apply, click here. Camperships: Families who require assistance can apply for a “campership” from the Service Unit. Our funds are extremely limited so we do ask that anyone seeking financial aid first apply through council and talk to your troop leader. If you are unable to obtain aid through council, please send a letter to the camp committee explaining your situation, how much aid you are requesting, and if your troop has any funds they are able to contribute. Feel free to contact the camp committee if you have any questions about this process. Where do we send our payment and how should we address it. I apologize in advance if we missed the information somewhere on the website. I just approved your roster. You should receive an email with payment instructions shortly.